Lifting its name from the old “Keystone Kops” films of the silent film era, Keystone Kapers was a late release for the VCS, coming out right around the time of the great video games “crash”. Unfortunately this left it buried in a pile of shovelware, which is a real shame because the game is a definite gem in the Atari’s library. You assume the role of a British “bobby” (slang for a police officer) chasing the imaginitively-named “Harry Hooligan” through a multi-story department store. While you always start off at the far right of the bottom floor, Harry starts on an upper floor, farther and farther from you with each successive level. Harry makes a bee-line for the roof, and you have to chase him down whole dodging various stationary and moving obstacles, such as shopping carts, model airplanes, and radios just sitting in the middle of the floor. 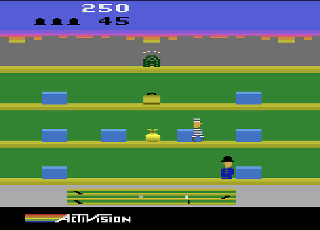 The number of obstacles predictably increases as the game progresses in order to increase the difficulty. You can change floors by making your way to the escalators at the end of each floor, or you can make use of the elevator, which can be faster if timed properly and also allows you to get ahead of Harry, in which case he will turn around and run the other way. A game clock starts counting down at the beginning of each level. Coming in contact with one of the obstacles momentarily freezes your character, and knocks 9 seconds off of the clock, with the exception of the model airplane which causes instant death. If the clock reaches zero before you reach Harry, you die and the level starts over. You score points both by collecting “loot” that’s been dropped throughout the level, and with an end-of-level time bonus. The game gets repetitive, but it’s an arcade title that’s played for high score, not an adventure game. In addition to being released on multiple classic consoles, the game can be played on the Sony Playstation 2 and Playstation Portable on the “Activision Anthology” collection, and is available for download on Xbox Live Arcade. Buy Keystone Kapers on GameGavel or Amazon. Tagged 2600, Activision, Atari, Keystone Kapers, Review, VCS. Bookmark the permalink.